Third gull leaves Scotland this week. Well it’s been a busy week with our gulls leaving Scotland. First Luna, then Stuart and today we have discovered Kingpin has left Lochwinnoch. He has been happily scoffing dishes of catfood all summer at his friendly homeowner’s house in the village but yesterday was the day to head off. He was last in the village at 1430 before flying in near enough a straight line south. He was near Maybole by 1600 and off the coast of Scotland near Cairngaan at 1800. By 1905 he was flying over the Isle of Man and midnight saw him over The Skerries off the north Wales coast. 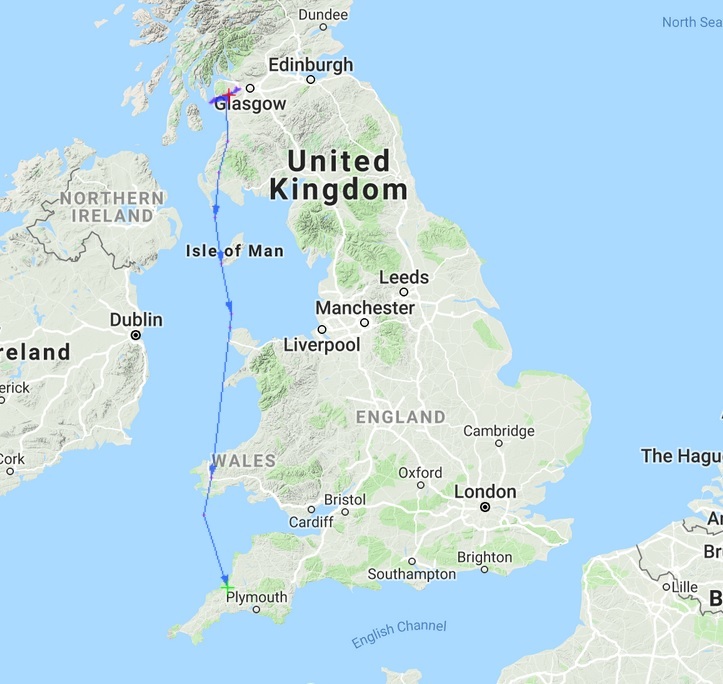 He was off the south coast of Wales by 0812 this morning and our last update has him in Cornwall at Tregoodwell at 0917. Will it be France or Spain next? And does he know another friendly house to get a dish of catfood?